WASHINGTON— A flood of tax payments pushed government receipts to an all-time high in April and left the country with the largest monthly budget surplus in seven years. In its monthly budget report, the Treasury Department said Tuesday that the April surplus totaled $156.7 billion, up from a surplus of $106.9 billion a year earlier. It was the largest surplus since April 2008. Government receipts totaled $471.8 billion, the largest monthly total on record. Receipts for the first seven months of the budget came to $1.89 trillion, the biggest seven-month total ever. Tax receipts have climbed thanks to an improving economy, which has boosted individual and corporate tax payments. Through the first seven months of the budget year that began in October, the deficit totaled $282.8 billion, 7.7 percent below last year. The Congressional Budget Office is forecasting a full-year deficit of $486 billion, roughly on par with the previous year. From October through April, revenues totaled $1.89 trillion, up 8.9 percent from the same period last year. Individual payroll taxes and Social Security taxes are running 6 percent higher than a year ago, while individual taxes on stock dividends, capital gains and payments by the self-employed are running 17 percent above last year. Government outlays over the past seven months totaled $2.17 trillion, up 6.4 percent from the same period a year ago. 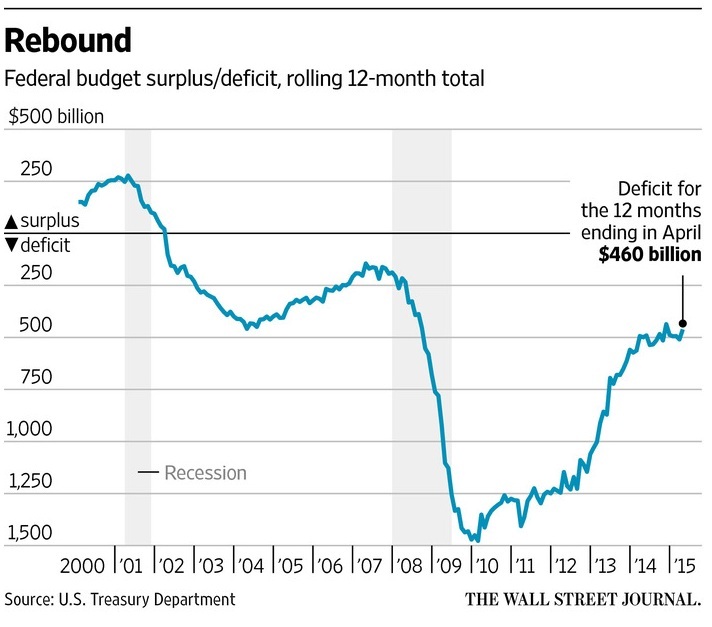 The 2014 deficit was down from $680.2 billion in 2013. Before 2013, the U.S. had recorded four straight years of annuals deficits above $1 trillion, reflecting the impact of a severe financial crisis and the worst recession since the Great Depression of the 1930s. President Barack Obama in February unveiled a budget for 2016 — his final full year in office — that seeks authorization from Congress to spend $4 trillion next year. It projects a deficit of $474 billion. Obama’s budget would boost spending on domestic programs such as increased road construction while raising taxes by $2 trillion over the next decade by expanding levies on the wealthy, corporations and smokers. Republicans have attacked Obama’s proposed tax increases and the fact that his budget plan never reaches balance. A GOP budget cleared Congress earlier this month. It sets a potential path for a balanced budget within a decade by cutting spending at domestic agencies and government benefit programs like Medicaid and food stamps. Democrats charged that the GOP budget only balances on paper because Republican lawmakers will balk at approving the follow-up legislation that would enact the painful cuts needed to achieve balance without raising taxes.